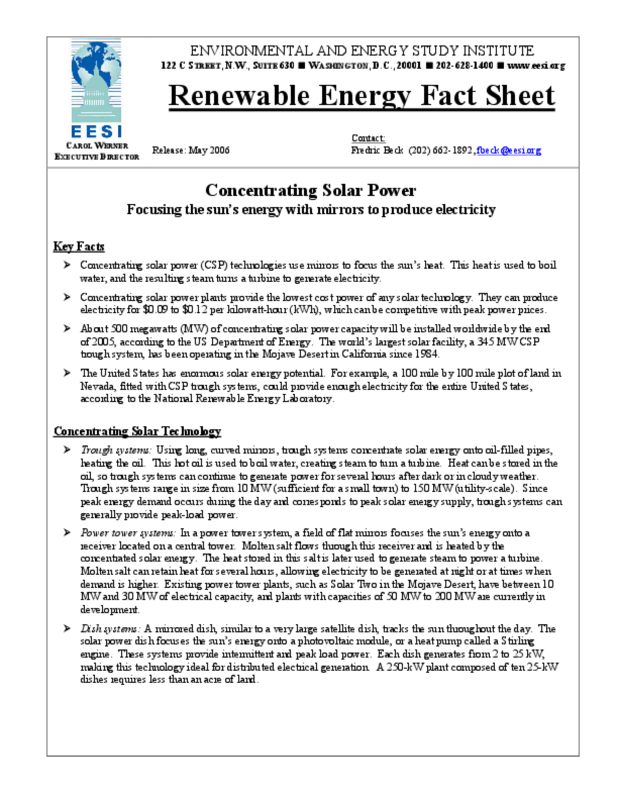 - Concentrating solar power (CSP) technologies use mirrors to focus the sun's heat. This heat is used to boil water, and the resulting steam turns a turbine to generate electricity. - Concentrating solar power plants provide the lowest cost power of any solar technology. They can produce electricity for $0.09 to $0.12 per kilowatt-hour (kWh), which can be competitive with peak power prices. - About 500 megawatts (MW) of concentrating solar power capacity will be installed worldwide by the end of 2005, according to the US Department of Energy. The world's largest solar facility, a 345 MW CSP trough system, has been operating in the Mojave Desert in California since 1984. The United States has enormous solar energy potential. For example, a 100 mile by 100 mile plot of land in Nevada, fitted with CSP trough systems, could provide enough electricity for the entire United States, according to the National Renewable Energy Laboratory.